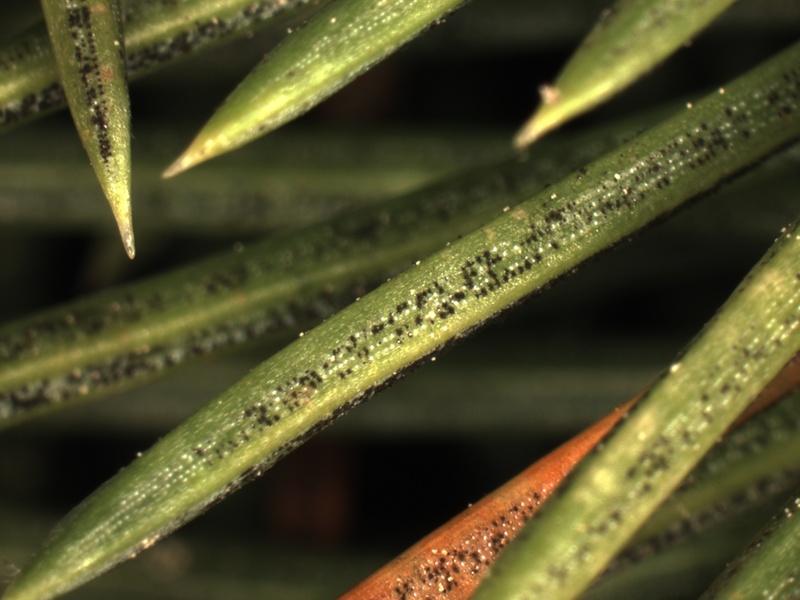 Stigmina needle cast, caused by the fungal pathogen Stigmina lautii, has emerged as an important foliar pathogen of blue spruce in the region. Colorado blue spruce (Picea pungens) and white spruce (P. glauca) are most commonly infected in landscape settings, while Norway spruce (P. abies), Oriental spruce (P. orientalis) and Serbian spruce (P. omorika) can also serve as hosts. Prior to 1999, when Stigmina lautii was identified in North Carolina on blue spruce, this needle cast pathogen was only known from western Canada on black (P. mariana) and white spruce. ​While Stigmina is found on a variety of forest and landscape spruce species, blue and white spruce are most commonly infected in southern New England. Mild temperatures and prolonged needle wetness favor disease development on emerging needles in the spring. The pathogen invades susceptible needles through the stomata (pores used for gas exchange) and symptoms may develop later in the growing season or the following year. When trees are stressed and weakened, symptoms of infection tend to develop more rapidly. Stigmina then sporulates from infected needles through the stomata and overwinters in diseased needles that have fallen to the ground or those that remain in the canopy. Stigmina behaves very similarly to Rhizosphaera and is easily confused. 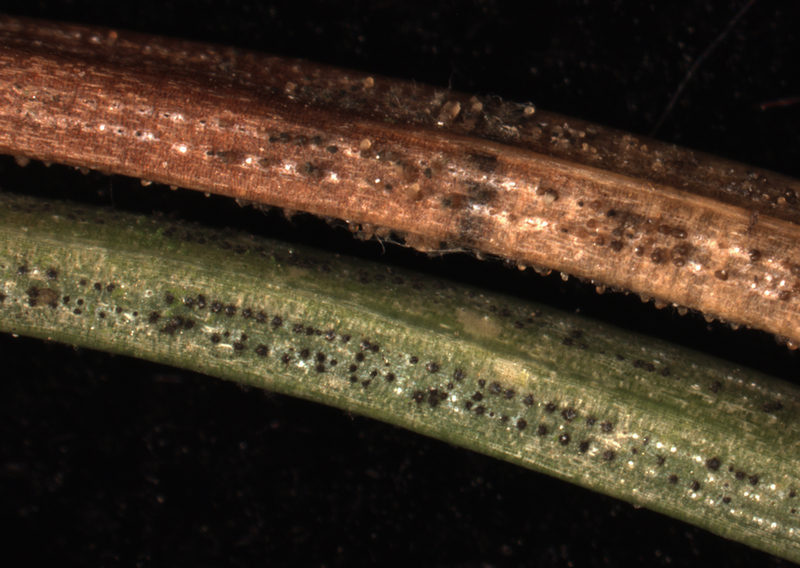 One distinguishing characteristic is that Stigmina can be found sporulating on green needles, while Rhizosphaera will produce spores only on needles that have become purple/brown. Very small, black-colored fruiting bodies emerge from the stomata and on close inspection have hair-like tendrils projecting outward from the center. At present, it is believe that Stigmina is not as aggressive as Rhizosphaera but much remains to be understood. Symptoms appear as premature needle shedding, especially of older needles on interior branches in the lower canopy where shade and moisture persist. However, current season’s needles can be symptomatic, often late in the growing season. Drought and infestations of the spruce spider mite can predispose trees to infection. In many cases, Rhizosphaera and Stigmina can be found co-occurring on the same tree along with other insect pests and fungal pathogens. Increasingly, however, Stigmina alone is present on trees with symptoms of needle cast, suggesting it is becoming a more prominent pathogen in our region. Prune out dead or dying branches in the lower canopy of landscape spruces and, if possible, remove discarded needles beneath the tree or cover with mulch. Prune interior branches close to the main trunk that are declining. The goal is to remove inoculum from the lower canopy to reduce the number of infected needles present. Additionally, increasing light and air flow can reduce needle wetness and humidity, environmental conditions required for sporulation. If possible, provide a soaking irrigation of the tree's roots during extended dry periods as needle cast diseases are exacerbated by drought. Many spruces are tolerant of dry settings and typically don’t require supplemental watering once they are well established, but the stress of premature needle loss can amplify abiotic stresses. Fertilization can also aid trees that have lost large volumes of needles and the photosynthetic products those needles would have produced. Broad-spectrum fungicides such as chlorothalonil (restricted use in Massachusetts), mancozeb and copper salts of fatty and/or rosin acids may have some utility in suppressing the fungus. 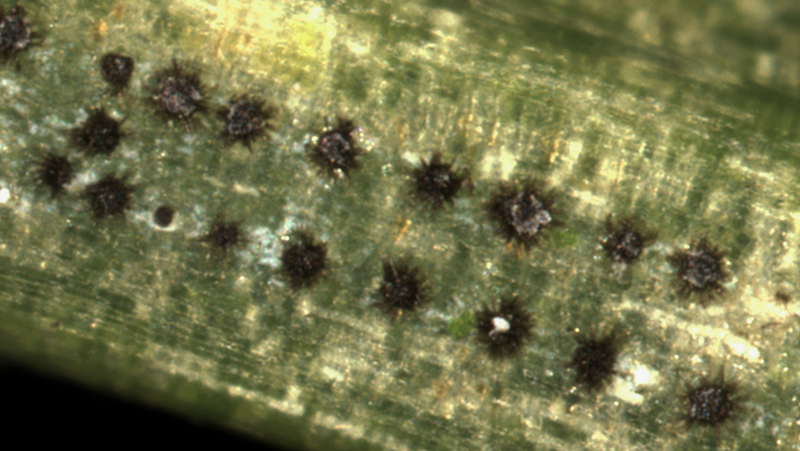 Little information exists regarding fungicides that have utility against Stigmina. Locally systemic fungicides like thiophanate-methyl and azoxystrobin may also have utility along with the highly systemic phosphite fungicides. They should be applied in the spring during new shoot and needle formation when new shoots are 1/2" to 1" elongated and on regular intervals should wet weather persist. If the infections are severe, treatment may be required again in autumn when temperatures cool (mid-September onward).